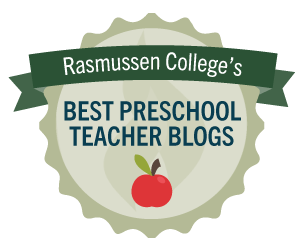 Today, I received an email from Rasmussen College that this little blog was handpicked as the top 15 first-class blogs for preschool teachers - isn't this wonderful?! I am greatly humbled and honored to be receiving this ward. I am not making this journey alone. Numerous people have supported me along the way, starting with my wonderful family and my students' families - but everything I do is inspired by and for my students! See the other amazing preschool blogs that made the list HERE! Congratulations, you deserve this recognition for your creativity. Thank you Ms Ginger! I'm always learning from the best!